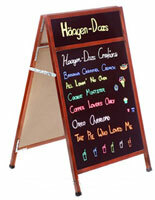 This A-Frame Chalkboard Is Perfect for Restaurants, Cafes and Retail Stores. Get Your Message Across with This Dual-Sided Sidewalk Signs. Choose The Perfect A-frame Chalkboard from This Website. Double-sided 24" x 36" writable blackboards for displaying written messages on both sides. Hardwood construction with white finish ideal for use in any store and business. 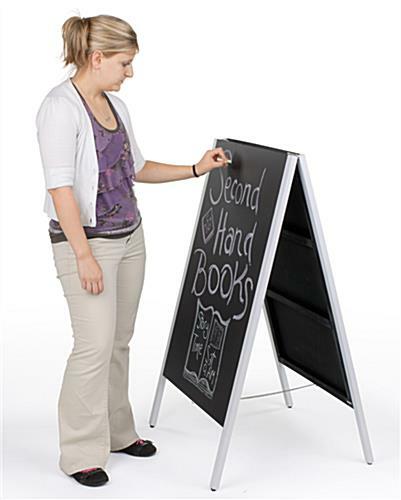 Black board surface designed for use with stick chalk or liquid chalk markers. 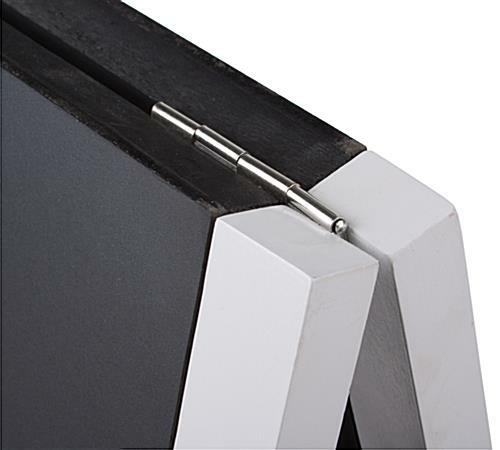 Top metal hinges for users to fold the unit flat for easy storage and portability. 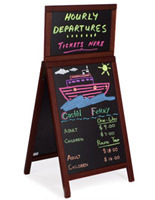 This a-frame chalkboard is an ideal choice for quick changes. Restaurants, cafes, bistros, bars and retail stores often use this write-on blackboard to lure potential customers into the establishment. This a-frame chalkboard, such as sidewalk display is made from wood with a beautiful white finish frame to match easily to almost any environment they are placed in. A blackboard easel, like the one seen here features two writing surfaces. This a-frame chalkboard that is double-sided allows users to write two different messages back-to-back to draw in passersby customers coming from both directions. Each side has a 24" x 36" textured blackboard surface which gives users plenty of space to create their advertisement. Users can be creative and generate an enticing message blackboard with this a-frame chalkboard that is made from wood! 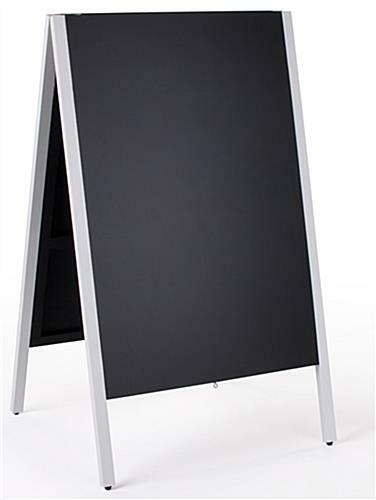 Businesses can use the easel black board to show promotional signage, menu listings, ongoing events and important announcements. A blackboard is not only a great marketing tool but also can be used in schools or daycare centers to educate children. 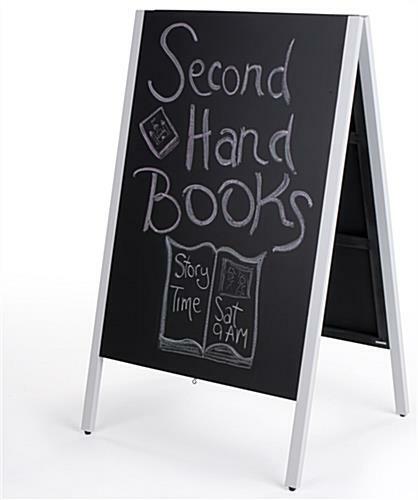 This wooden black board, a-frame chalkboard that has a textured blackboard is designed for use with stick chalks. Messages written using the chalk can be easily wiped off by using any wet or damp cloth. 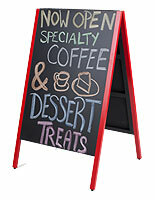 Therefore, for locations needing to change their signage often, this white a-frame chalkboard is the perfect solution! Users can also write on the blackboard using the liquid chalk markers (sold separately). However, customers may find it difficult to clean off the messages written using the liquid chalk markers. For that reasons, each unit will include a magic eraser which can help to wipe-off the board. 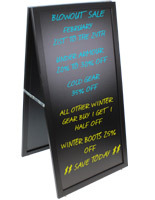 This write-on board, a-frame chalkboard can be used over and over again, as the writing surface can be easily cleaned. Another great feature about this blackboard is that the unit folds together. 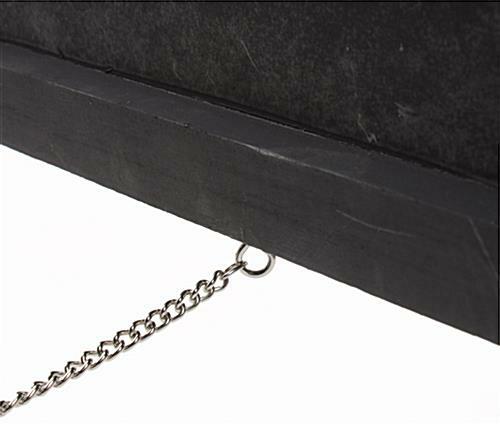 Top metal hinges can be found at the top of the easel a-frame chalkboard that is foldable, enabling users to fold the unit flat for easy storage and transport. Businesses can increase sales by placing the sidewalk signs at the storefronts or entryways. 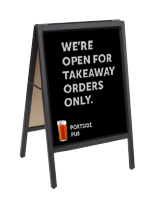 This wood black board is designed for use within indoor locations. These units can also be used outdoor, but with limitation (under fair weather conditions only). This website offers this blackboard easel in a red finish as well. Customers can also find many other styles and sizes of sidewalk signs sold here (see the related items on the right for more options). 25.5" x 43.3" x 26.0"